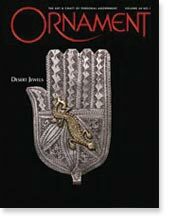 “Ornament Magazine” featured Cabrina Channing and her work in a beautifully written article about the ongoing “Passing The Torch” high-school metal arts competition in Washington State put on by the Seattle Metal Arts Guild. 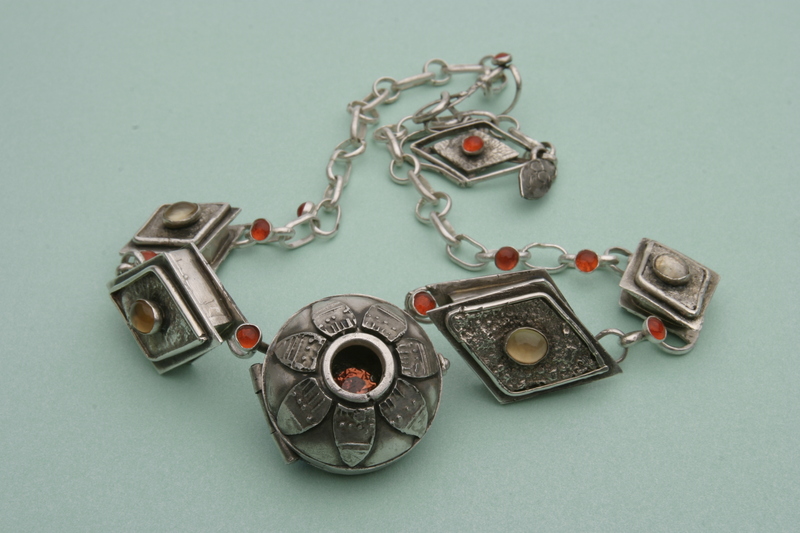 In 2005, she enteredÂ and received 1st place in the jewelry design category for washington state high school students.Â The winning piece, titled “Beyond Sight” is a sterling silver necklace consisting of four separate swivel rivet lockets and one hinged locket which opens two separate compartments within the piece. The back of the piece is adorned with photo etched designs from an antique Indian design book. There are also hand cut Citrines, swarovski crystals, and a large bright orange sapphire in the center of the hinged locket. The full necklace took Cabrina over one hundred hours of solid work to complete. The article mentions many other students who took home awards over the years and follows them to see where they are in the metal art world years later. The “Passing The Torch” competition recently overcame a struggle for continued funding and I personally hope it will continue to inspire young artists to pursue a life in metals art.